Get up close and personal with Melee Tactics Toolbox! 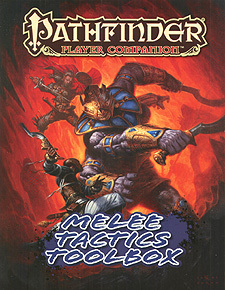 The new tips, tricks, and tactics in this volume enable your Pathfinder RPG character to perform a huge variety of daring deeds in hand-to-hand combat, whether you're dashing around a foe to flank it by yourself or inspiring allies to hold the line on a castle wall. Tips on how best to fight in melee, including suggestions for rules options that can give you an edge, as well as general tactics available to all characters. Dozens of new kinds of magic armour and melee weapons, weapon special abilities, and wondrous items to hinder your foes or protect you from close-combat attackers. Thirty new feats to bolster your staying power in close combat, including combat, style, and teamwork feats. An illustrated guide comparing more than 20 different styles of swords, including the falchion, katana, and urumi. Tons of new spells, equipment, weapons, class archetypes, and character options, including a new bardic masterpiece.